Nogueira de Ramuin is in the northern region of Galicia and its first inhabitants were the Celts in 1,000BC. This area was also where the tomb of the Apostle St James was discovered and later taken to the Cathedral in Santiago de Compostela where it now rests, which consequently made Galicia one of the most important pilgrimage centres during the Middle Ages. Nogueira de Ramuin is a riverside village, and although quite small, it has some very interesting places to explore such as the traditional mills. In the Luintra square stands a statue dedicated to the grinder artisans reminding us this was the land of mythical grinders-umbrella menders. It is also in the heart of an area of outstanding beauty known as the Ribeira Sacra. Translated, it means ‘Sacred Shore’ and is a combination of valleys and canyons along the Sil and Mino Rivers. The rocky walls of the Sil Canyon are particularly popular with climbers, and there are also many excellent routes for walkers, and those who wish to explore the area on horseback. There are several cruises that will take you down the river giving you an excellent opportunity to take in the stunning scenery. Being a major wine producing area, many of the steep slopes are lined with vineyards. It is believed that grape growing was first introduced to this area by the Romans, and during the Middle Ages the monks of the local monasteries re-planted the vines and maintained the process of wine production until eventually modern methods took over. 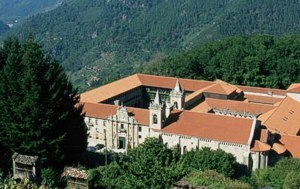 Tucked amongst the chestnut-trees on a slope leading down to the Sil River is the Monasterio de San Esteban de Ribas de Sil, one of the Galicia’s most important monuments. 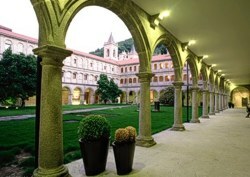 This Benedictine monastery is now the Parador Santo Estevo (Hotel Monasterio de San Estevo), a four star hotel that consists of three cloisters, wonderful views of the river and a restaurant serving international and regional cuisine. Only 28km away is Ourense, the birthplace of both Julio Inglesias and Fidel Castro’s family. The old quarter is particularly interesting with its Cathedral and Roman Spa. Being an area rich in hot springs, there are numerous places where travellers can bath in open-air pools, taking in the therapeutic properties of these thermal waters. Las Burgas Thermal Springs in particular dates back to the 17th century. The Cathedral in Ourense was built in the 12th century on the site of a primitive temple from Swabian times, with a ground plan in the shape of a Latin cross. The Viejo bridge that runs over the Mino River actually goes back 2,000 years to when the Romans occupied the town, and was the gateway to Santiago to Compostela. Rebuilt in the 13th century, final modifications were made during the 17th century. Other fascinating sites to visit is the 12th century Old Episcopal Palace, the Oca-Valladares Palace, the Santa Eurfemia Church which Friar Placido Inglesias was responsible for the supervision of the design. The Santa Maria Nai Church originally built in the 10th century had to be rebuilt eight centuries later. There is also an excellent archaeological museum containing exhibits of items dating back to the Palaeolithic period, the Iron Age, and the Roman era. The most important section of this museum is the Iron Age forts and a collection of stone sculptures and warriors. With so much history to take in, as well as a range of outdoor activities to enjoy in this area of outstanding beauty, there is no place more appropriate to stay than the historically significant Parador Santo Estevo in Nogueira de Ramuin.